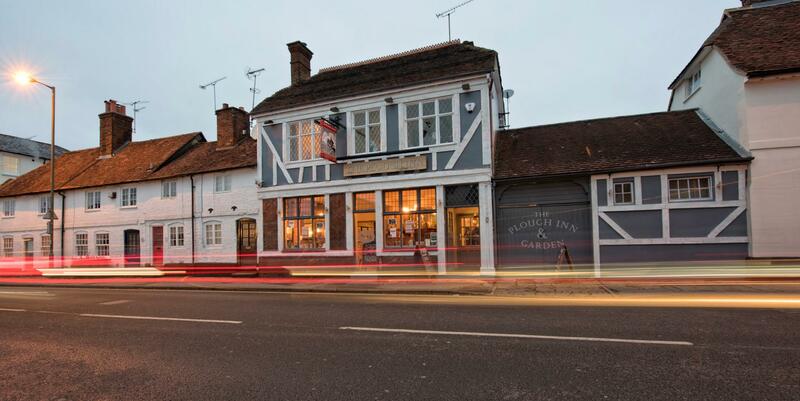 A vibrant local pub situated on West Street, Farnham, the Plough Inn prides itself on fine ales, great food and a fantastic line-up of live music. Bands and artists perform here every Friday and Saturday night, making it the perfect place for a weekend social, while there’s a jam night every Wednesday to provide music lovers with a midweek fix! Even when the volume is turned down a notch, there are plenty of reasons to make the Plough your local. There’s a popular pool table with league matches taking place on a Monday evening, a beautiful fireplace to help overcome those winter chills, and of course an excellent selection of real ales, wines and spirits. Enjoy all of this in our newly refurbished interior or outside in the spacious beer garden. There’s good honest pub food available too, served from Tuesday to Sunday. Homemade burgers of all shapes and sizes and a scrumptious Sunday roast are among the culinary highlights of our week. It all awaits in the heart of Farnham's town centre, within a stone's throw of the 12th century church and the famous Farnham castle. So whether you live and work locally, study at the University of Creative Arts or are just in town for the day, The Plough promises a warm welcome for all… including well-behaved dogs! From our Headliner burgers and classic pub favourites to delicious Sunday roasts and weekly specials, there's always tasty grub available for adults and children alike. Take a look at our menus page for more information on our lunchtime meal deal, Christmas buffets, roast options and specials. The Plough is your home for live music and events in Farnham. With bands booked every Friday and Saturday night, plus our jam nights every Wednesday open to all musicians, there's something for everyone week on week. Click on the link below for the latest info!